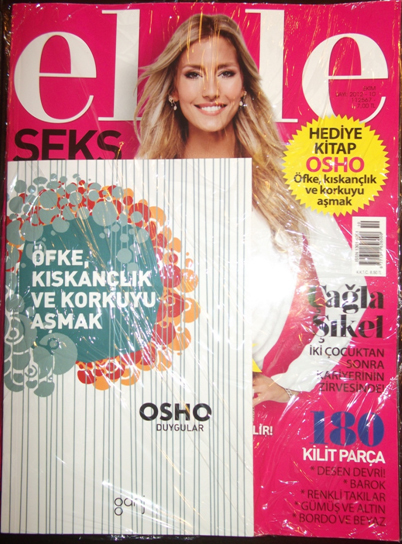 Istanbul/Turkey: Buyers of the ELELE fashion magazine in Turkey got a special surprise when the October edition of the popular Turkish women magazine came with a free OSHO book. The Turkish edition of EMOTIONS: Freedom from Anger, Jealousy & Fear came as a free gift with each copy. 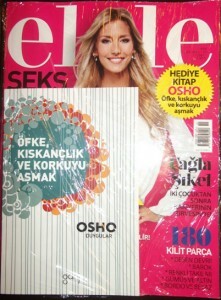 The Burda Group in Turkey – publisher of the magazine – had arranged this special deal with Ganj www.facebook.com/Ganj.Kitap, one of the four publishers in Turkey who publish books by Osho. Ganj publisher Erdogan Semsiyeci (Sangeet) shared that the deal was a long time in the making. ELELE was interested for some time to add an Osho title to the magazine because Osho addresses mainstream issues in a way like nobody does. Sangeet who has published a large number of popular Osho titles in Turkey can see not only from the sales numbers that Osho has found his way into the hearts of Turkish people. “It is simply incredible to receive phone call and mail from people from all around the country who are sometimes in tears sharing the impact of Osho’s words on their lives” says Sangeet. EMOTIONS: Freedom from Anger, Jealousy & Fear addresses in small quotes and text excerpts from different Osho talks some of the most impacting emotions human beings deal with. Simple meditation techniques suggested by Osho give readers a practical experience to find new ways of dealing with strong emotions.